Namaste, David Jay, on The SCAR Project’s recent nomination for Osocio’s Best Campaign of the Year 2011. The campaign of the Year competition is Osocio’s yearly election for the best in non-profit advertising and marketing for a social cause. Click here to view the 2011 nominees, including The SCAR Project. Click here to view the post entitled, “Breast Cancer Is Not A Pink Ribbon” in which The SCAR Project was nominated for the Osocio. What an honor. Thanks to Osocio. Congrats to David Jay. Cheers to the health of all the SCAR Project Girls who bare their scars to show us what really lies beneath the pink ribbons. And here’s to it all making a difference, by creating true traction to find a cure. The SCAR Project is a series of large-scale portraits of young women confronting breast cancer shot by fashion photographer David Jay. In the groundbreaking exhibition, this young generation of survivors reveals what is really beneath the pink ribbons. SCAR is an acronym: “Surviving Cancer. Absolute Reality.” Primarily an awareness raising campaign, it puts a raw, unflinching face on young women and breast cancer while paying tribute to the courage and spirit of so many brave young survivors of this disease. To view a slideshow of images on The SCAR Project web site click HERE. Dedicated to the more than 10,000 women under the age of 40 who will be diagnosed this year alone, The SCAR Project is an exercise in awareness, hope, reflection and healing. The mission is three-fold: raise public consciousness of young women with breast cancer, raise funds for breast cancer research/outreach programs, and help young survivors see their scars, faces, figures and experiences through a new, honest and ultimately empowering lens. David Jay has been shooting fashion and beauty professionally for over 15 years. His images have appeared in a multitude of international magazines and advertising campaigns. Like so many others personally touched by the disease, Jay was inspired to act when a dear friend was diagnosed with breast cancer at the age of 32. Like the subjects themselves, Jay’s stark, bold portraits challenge traditional perceptions of the disease and capture the raw beauty, strength and character of so many extraordinary young women. Each portrait represents a singular, stripped-down vision of the life-changing journey that unites them all. Breast cancer is the leading cause of cancer deaths in young women ages 15-40. The SCAR Project participants range from ages 18 to 35, and represent this often overlooked group of young women living with breast cancer. They journey from across America – and around the world – to be photographed for The SCAR Project. Nearly 100 so far. The youngest being 18 years old. The International SCAR Project Exhibition premiered in New York City in October 2010, then in Cincinnati and a second DC showing in October 2011. The SCAR Project will premiere in DC in October, kicking off breast cancer awareness 2012 from our Nation’s Capitol. 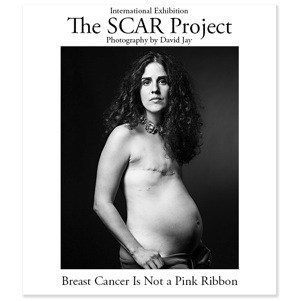 This blog will follow The SCAR Project exhibition as it tours, David Jay as he continues to shoot the portraits, and will also feature interviews with The SCAR Girls.